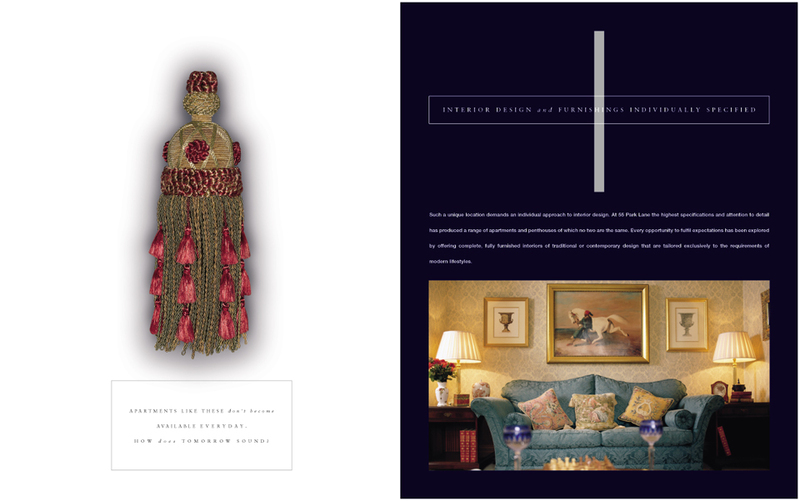 Here we had to produce literature and ads for the sale of furnished apartments in a prestigious London location. Needless to say the target market wanted only the best. To create marketing material for the sale of apartments at 55 Park Lane. Wealthy individuals looking for a Central London address with security, concierge and fitted to a high standard. These apartments are in a fantastic and desirable location. In the heart of Mayfair I will be near my favourite shops, restaurants and hotels. I am also directly opposite Hyde Park. I can park and the concierge will tend to my requests if i need anything. They also come fully furnished to my choice which is a bonus. 55 Park Lane. Location and quality like this isn’t on the market often. Photography of desirable items such as jewelry, furnishings and clothes were used to illustrate the finer points and advantages of this location. All the apartments sold and have undoubtedly since increased in value.